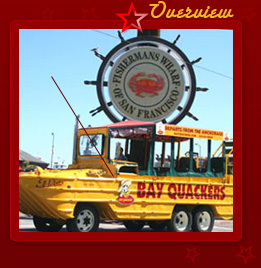 I suppose it was only a matter of time before Ride the Ducks and Bay Quackers ended up in litigation. Both companies operate land-and-water tours using amphibious vehicles of a type known in World War II as DUKWs or "Ducks," whence cometh the company names. Both have expanded on this theme by handing out duck calls and encouraging tour participants to quack during tours. Since 2008, both have been operating in San Francisco. And so, inevitably, there is litigation. Specifically, Ride the Ducks sued Bay Quackers in May, alleging that it holds trademark rights to the sound made by a boatload of quacking tourists and that Bay Quackers must cease and desist. of duck call devices throughout various portions of [guided amphibious vehicle] tours." The lawsuit alleges that Bay Quackers' use of the sound is infringing and is likely to confuse consumers. Certainly, the sort of consumer whose primary concern in selecting a tour is whether he or she will be able to quack during it is likely to have a high probability of confusion. Whether this extends to consumers at large is harder to say. I think there is also a strong possibility of confusion among residents of San Francisco, in that, if they were being loudly quacked at by a boatload of each company's tour participants at the same time, they would not know which direction to shoot first. to, the sounds made by Ride the Ducks' Wacky Quacker device." (That is, they make duck noises.) 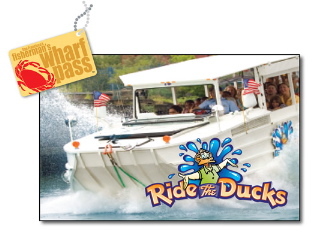 Ride the Ducks alleges that this is trademark infringement and unfair competition. It wants an injunction to prevent Bay Quackers from quacking. It also seeks "disgorgement of profits, gains and advantages obtained from use of the mark," although I am guessing it might be difficult to quantify the "profits, gains and advantages" obtained from quacking, so probably the injunction is more likely. What isn't clear to me is whether Bay Quackers could avoid liability if it just got rid of the duck calls themselves and had its customers quack on their own. I hope so, because while the duck calls are just annoying I would enjoy seeing tourists doing their own quacking. I don't know why it matters, but it does. For what it's worth, which is nothing at all, I have decided to support Bay Quackers in this dispute for reasons that have nothing to do with the merits of the case. To begin with, Bay Quackers was here first. It has been operating in San Francisco since at least 2006, as far as I can tell, while Ride the Ducks showed up only in 2008. Second, Bay Quackers vessels have saved at least two lives, according to this report. Personally I would have mixed emotions if I saw a boat full of quacking tourists bearing down on me, but that water is pretty damn cold. Third, and most importantly, Bay Quackers does not use the term "quack-tacular." That particular horror is unique to Ride the Ducks.